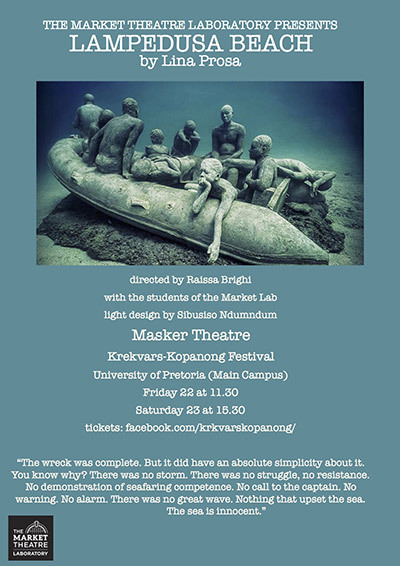 Lampedusa Beach won the Kopanang Award at the Krekvars-Kopanang Festival 2016 for theatre engaging with human rights issues. We are thrilled to be the recipient of this award, especially because it is the second time in two years that the Lab has been recognised for creating excellent theatre that engages with human rights. This positions the Lab uniquely as an education and development facility concerned both with providing access to quality theatre and performance training to marginalised youth, and with creating meaningful theatre that contributes to wider conversations about pertinent social dynamics and realities. Lampedusa Beach is a poetic story about the challenges of decodifying the wounds and the destiny of African migrants. The final destination seems to offer a new life in a new country where dreams can come true. Instead this destination becomes an infernal cave, in a cemetery with no crosses, ready to engulf bodies and dreams. The island of Lampedusa is the gateway to the South of Europe, it is a meeting point between two worlds, but it has now become a graveyard. It represents a point of contact between Africa and Europe, just like the text of this play. Lampedusa Beach is the story of Shauba, who narrates her journey from Africa to Italy, up until her final destination at the bottom of the sea.